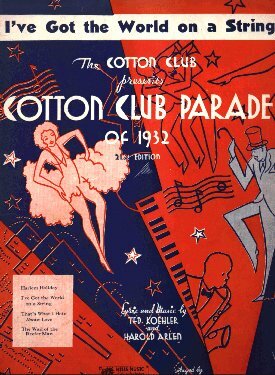 “I’ve Got the World on a String” was written for the 1932 Cotton Club Parade, where it was introduced by Cab Calloway and Bing Crosby. Alec Wilder, in American Popular Song, considers it one of Arlen’s loveliest songs. “I’ve Got the World on a String” was recorded live at Tony Bennett’s concert at Carnegie Hall on June 9, 1962, but was not released until 1997 on the album Tony Bennett at Carnegie Hall: Complete Concert. Ralph Sharon arranged the song. “I’ve Got The World On a String” was recorded in June 1992 and was released that year on Perfectly Frank. It was arranged by Ralph Sharon. “I’ve Got The World On A String” was recorded September 2, 2000 with Diana Krall and was released in 2006 on Duets: An American Classic [Target Stores version].